For a sumptuous meal to be enjoyed at any Bistro Group restaurant. Great for sharing at any Bistro Group restaurant. Best for small group dining at any Bistro Group restaurant. An instant hit with Filipinos, Italliani's is a fusion of American and Italian cuisine designed to satisfy local and foreign taste buds. Imbibing the experience of a family-owned dining restaurant, this establishment has a staff that makes you feel at home from reception to departure. Start the meal with their complimentary home-baked breads served with vinegar and olive oil, and cap it off with any of their signature desserts. Each eGift has a unique code that corresponds to an amount or item. To use the eGift at the store, the code must be given by the recipient to the store manager for validation. The recipient must wait for the store manager to finish the validation process. The store manager will receive a validation response indicating the eGift amount and validity. The store manager will follow only what is indicated in the validation response. The recipient is responsible for the safekeeping of the eGift code. The recipient must only give this to the store manager once he/she commits to use it at the store. In the event that the store's eGift validation system is offline or unavailable, the store manager shall politely decline to accept the eGift. The recipient may still use the eGift when the system is back online. The eGift may not be valid for use on certain promotional items/services and it cannot be exchanged for cash. The eGift is for one-time use only. If the total value of eGift is not used up, there will be no cash change given. If the purchase goes beyond the eGift amount, the recipient is to pay for the difference. Multiple eGift codes may be used per transaction. 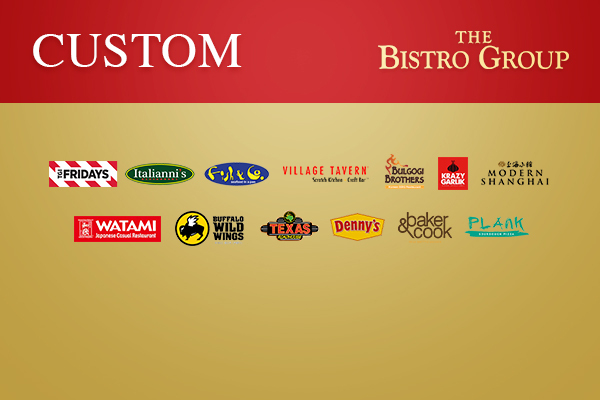 The eGift is valid for use at any Bistro Group restaurant: TGI Friday's, Italianni's, Fish & Co., Krazy Garlik, Modern Shanghai, Watami, Bulgogi Brothers, Village Tavern, Buffalo Wild Wings, Baker and Cook, Texas Roadhouse, and Denny's. 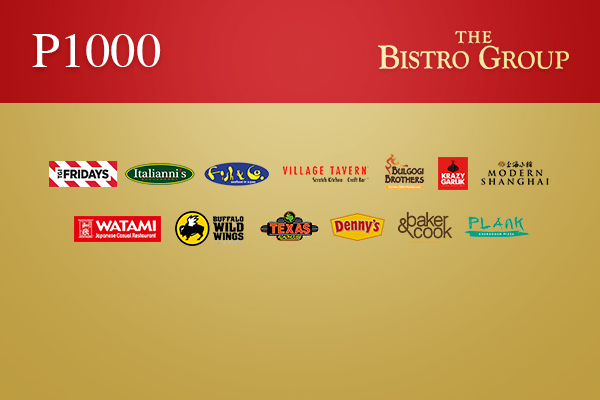 If the eGift is a Bistro BFF Card, it is not valid as payment for food because it is a loyalty card. eGift is not valid for BFF card and other merchandise purchases. The eGift is not valid for delivery transactions. For inquiries or assistance, please contact us.